These things happen, I'd rather get perfect late than shoddy on time. I suggest that you check out the Sunnto watches for great quality which does not sweat and is comfy even in humidity, heat and rain. this would also ensure spares are available at high end stores. I don't want to run this into the ground or anything, but can you at least say whether you think you'll be shipping this calendar year? Concerning the shipping box: how about minimalistic? Instead of the standard massive shipping boxes that seem to be more decorative (even though they're thrown away immediately) brings not only extra costs and pollution, but also annoyance. Just a small cardboard box with no plastic rubbish that we're going to throw away anyway is more than enough. In the Pebble music app, I think the middle button should be to skip to the next song, not to play or pause. How often do you need to pause a song? How often do you want to skip to the next song? Obviously a skip track button would be more useful than a pause button. @Tae-Jin Moon because it's not just for iOs devices.. Taking longer is better than for you guys to hurry and ship a 2nd class product. Seems the caption under the last photo was missed by the majority: "Music control - You can skip tracks by double tapping the centre button". I really appriciate that you take the time you need on this really exiting watch and don't compromise! I'd rather wait a little longer following your progress knowing it's really going to be a '"geek treat" receiving the final product. three times -> previous song. Id rather track control that volume! My opinion on the volume issue: single press: volume up/down, long press: track skip/rewind. Thanks for the update guys. I like the user interface sneak peek, makes me want my pebble even more! I agree with Miles - an option in settings for the music control to have the buttons as next/previous or vol+/vol- would be perfect! When will those of us who took the "choose a colour" level of reward be being sent out the survey to choose what colour we'd like to have out pebble in from the white/red/black/orange choices? Just wanted to speak up for the current volume controls. I almost never use skip forward/backward on my iphone and would much rather have the current volume up/down controls left as they are. Perhaps a user option for volume up/down or next/previous is the most pertinent solution? I have to agree with Matthew on that volume comment. I will set the volume once on my phone and forget it. However, I am constantly changing tracks that I listen too and skipping things that I'm not in the mood for. I think it is much more important to have a next/previous button and pause/play. It will be a much more useful tool and gaget that way. If this were a live keynote, you'd get a hearty round of applause. Looking forward to my next step digital integration. Shipping test - great idea. If you want to help with shipping - try to contact Shipito.com , they are the biggest mailforwarder in U.S. and have huge discounts on Fedex and other carriers for international shipments. I'd like to add to the feedback on the volume control. I mainly listen to podcasts, and I never change the volume. But play/pause and skipping back or forward is my main UI. From my point of view, those should be the primary functions available. Volume is something you set and forget. Perhaps some research on how people use their media players and the most common controls is worth doing. Can you give a ballpark figure for shipping? This year? Thanks for the update. This is the kind of progress report that I've been craving since the project was funded. Please keep them coming regularly. I appreciate your recognition that you need to keep your MANY backers informed about delays and the like. If you do that, and put out an item worth waiting for, you'll minimize the grumpies. Yes please - make sure it's right! 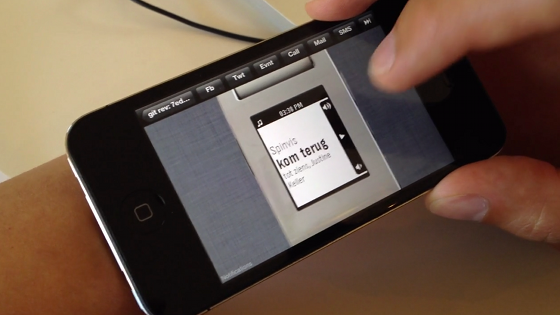 I am also hoping some kind of iPhone SDK data comes out soon! Keep up the good work. I appreciate the updates and the progress. The finish line is almost there, good luck! Awesome! Really cool to watch the manufacturing process develop. Really looking forward to the watch delivery date. awesome job - thanks for the update guys! As many are saying: take your time - happy to wait and get a better product as a result - those that are being impatient will forget the delays shortly after the watch lands on their wrists! Raising 10.2M and then leaving a ship date open ended is not good. Where is the accountability for you guys coming from. I don't want to be negative here, but if you raised 10M from VC, they would not allow you to say you will get a ship date when we feel confident. I think you owe it to your investors/customers to set goals, and do everything required to meet them. Your working with our cash now, and I would never give someone my money and let them tell me that they don't know when I will see a return, but watch through my windows and maybe you can guess when that will be. This can easily be combated with updates showing you're still there (like this one), even if they are mundane updates. Other projects I've "invested" in provide weekly, or even daily updates. While some folks may not like that frequency, it at least shows progress. @Ryan, yes this is what we have it set up as now. Double tap the centre button to skip track forward. Excited and patient. Take your time, no need to rush to make unrealistic deadlines. Keep up the good work. I would rather wait longer for quality. This looks awesome and I cant wait to develop for it! Thanks for the great update! We are all clearly very excited for the Pebble and any news is appreciated. Since you're playing around with iOS 6 has there been any discussion around SMS integration? I assume a double tap to skip forward and tripple tap to skip back, like the apple earbuds? Thanks for the update! I'm really excited. I want have my pebble and try all this things by myself. Thanks for your hard work, informative email updates, and puting quality of product more important than a shipping date. We can wait . . . You and your team just keep doing what you're doing, and the release to shipping will take care of itself. I'm proud to be a contributor to the project. Side note: In the demo you're showing an email that talks about how Pebble will be a guarantor on a house + pay $1k/month for parties and socializing. You guys should probably watch exactly what you're demo'ing. ooOOOO... nice! AND a great update! Thank you! As long as its done right... I seriously do not mind waiting. I like the way the update has come this time around. Looking forward to more of such updates. 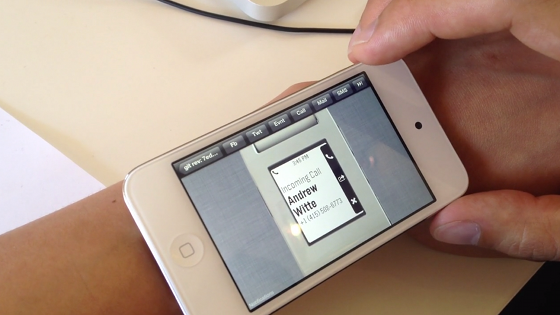 In the video the pebble interface on the iOS App scrolls really smoothly from one menu point to the next, however, since you're using an e-paper display, there won't be any of that on the actual pebble, no? I assume the refresh rate will be much too low... Wouldn't it be smarter then to design the interface with this limitation in mind? Or am I misinformed?